I have been in a funk in the studio for the past couple of weeks. It feels as though any momentum or confidence about my work that I thought was permanently embedded in myself seems to have completely evaporated. I should have known better than to think that things had changed, that I had somehow gained some new kind of unwavering confidence that would inure me to my natural uncertainty. This happens quite often with me, as I have documented here before. Like the words from Goethe below, my own progression as an artist moves in a spiral, sometimes pulsing forward and some times retreating. with rhythms of progress and retrogression, of evolution and dissolution. I was looking at a book catalog yesterday, just browsing for something new and I spotted a book on the works of Robert Smithson, who is best known for his monumental earthworks. The most famous is shown here, the Spiral Jetty, which juts out into the Great Salt Lake in Utah. I’ve always been somewhat fascinated by earth-moving on a large scale and have admired Smithson’s work whenever I came across it. The reason I mention this now is that I found myself thinking smaller lately, painting smaller paintings for a smaller economy. Part of this was a conscious decision but part was the result of just becoming a little more wary with all the turmoil in the world. There has been a period of introversion marked by a noticeable withdrawal from thinking boldly. Seeing this reminded me of the need to think big. I realized I had become a bit fearful of pushing myself, perhaps afraid of exposing my limitations. I had lost a little faith in my own abilities, including the ability to adapt to new challenges. I was being safe. It was the retrogression that Goethe talks of in the quote above. I was in the spiral. This all flashed in my head within a few seconds of seeing the spiral jetty. Funny how a single image can trigger a stream of thought with so many branches off of it. I had forgotten that I had to trust myself and throw the fear of failure aside, that thinking bold almost always summons up the best in many people. Once you say that you don’t give a damn what anyone says, that if you fail so be it, the road opens up before you and your mind finds a way to get you on it. So I have to remember to think big. To look past the horizon. Just freaking do it. 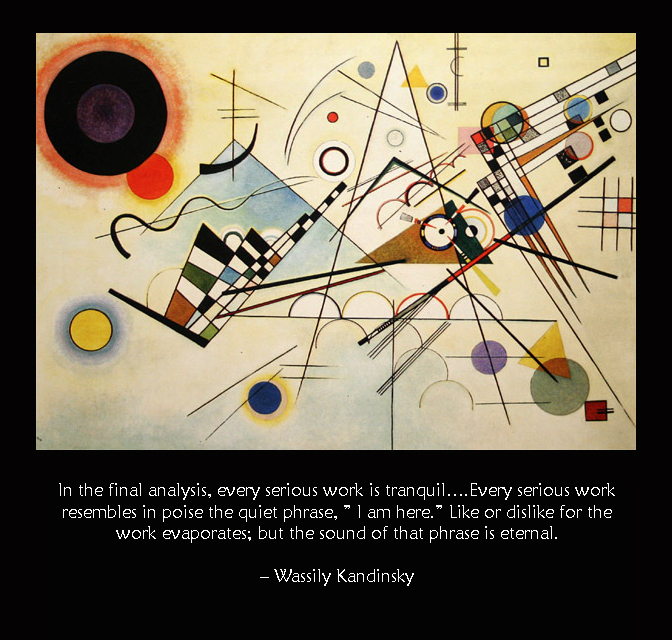 The above quote is from Wassily Kandinsky and concisely captures what might be the primary motive for my work. I think, for me, it was a matter of finding that thing, that outlet that gave me voice, that allowed me to honestly feel as though I had a place in this world. That I had worth. That I had thoughts deserving to be heard. That I was, indeed, here. This was one of the early posts from this blog from back in 2008. It remains true to this day, nearly ten years later, as the idea of “I am here” still drives my work. Maybe this will be one of the things we touch on this coming Saturday, August 4, at my Gallery Talk at the West End Gallery, starting at 1 PM. Maybe. Or maybe we’ll just have a sing-along. Who knows? It’s a fluid thing. I am swamped in work today. I say that a lot and it might sound awful to many folks. But for me it is the best possible situation because being at work means that, like Bacon says above, I am amidst the excitement and possibilities that come with working. Thinking about ideas, mulling what you’re going to do has a place but they are worthless nothings until they go into process, become work. Then they usually become something altogether different because the work allows you to flesh out what the mind alone couldn’t imagine. The process of working is the true generator of ideas. There have been many artists through time who have expressed this same sentiment, that doing work generates new work, creates new possibilities. I know that it is true for myself. Breakthroughs in the work always come while working, with hands in paint and eyes and mind straining to see where the piece before me ends and the next begins. Here’s one of my favorite inspirational pieces from artist Chuck Close that very much says the same thing: Don’t wait on inspiration–make your own! The advice I like to give young artists, or really anybody who’ll listen to me, is not to wait around for inspiration. Inspiration is for amateurs; the rest of us just show up and get to work. If you wait around for the clouds to part and a bolt of lightning to strike you in the brain, you are not going to make an awful lot of work. All the best ideas come out of the process; they come out of the… work itself. Things occur to you. If you’re sitting around trying to dream up a great art idea, you can sit there a long time before anything happens. But if you just get to work, something will occur to you and something else will occur to you and something else that you reject will push you in another direction. Inspiration is absolutely unnecessary and somehow deceptive. You feel like you need this great idea before you can get down to work, and I find that’s almost never the case. I am taking that advice and just doing what I do. You do what you do, okay? This morning, I am taking the advice below from Ray Bradbury and simply doing things.I can tell you from my own experience that his words ring true. All too may times I have started a painting based on an idea, some novel concept that was I believed to be well thought out. Those paintings are usually the ones that die on the easel. The best work, the stuff that seems to have its life force, comes outside of thought. So, my thinking goes on a hiatus starting now. Here’s a replay of a post from several years back on the subject. I came across this quote from famed sci-fi writer Ray Bradbury on a post on the TwistedSifter site that featured quotes on creativity. This struck close to the bone for me as I have proudly not thought for years now. 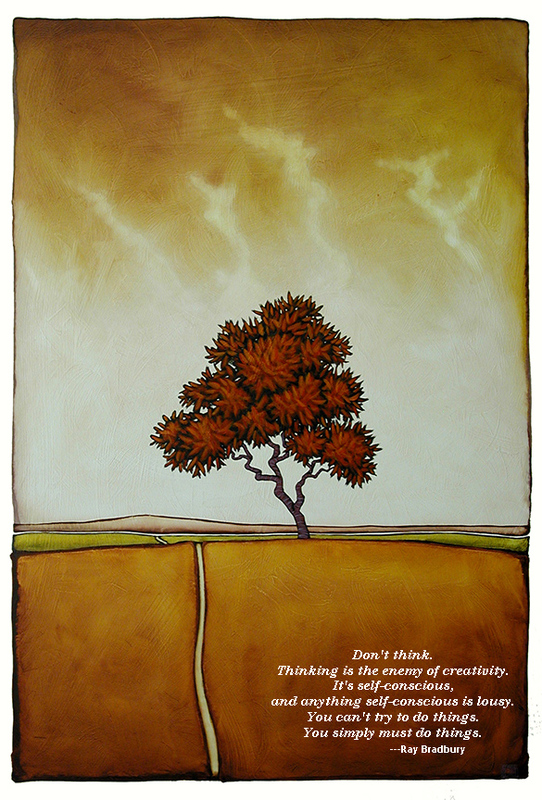 I have long maintained that thinking usually inhibits my work, making it less fluid and rhythmic. It’s a hard thing to get across because just in the process of doing anything there is a certain amount of thought required, with preliminary ideas and decisions to be made. I think that the lack of thought I am talking about, as I also believe Bradbury refers, is once the process of creating begins. At that point you have to try to free yourself of the conscious and let intuition and reaction take over, those qualities that operate on an instantaneous emotional level. I can tell instantly when I have let my conscious push its way into my work and have over-thought the whole thing. There’s a clunkiness and dullness in every aspect of it. No flow. No rhythm. No brightness or lightness. Emotionally vacant and awkward. Bradbury’s choice in using the term self-conscious is perfect because I have often been self-conscious in my life and that same uncomfortable awkwardness that comes in those instances translates well to what I see in this over-thought work. So what’s the answer? How do you let go of thought, to be less self-conscious? I think Bradbury hits the nail on the head– you must simply do things. This means trusting your subconscious to find a way through, to give the controls over to instinct. And how do you do that? I can’t speak for others but for myself it’s a matter of staying in my routine. Painting every day even when it feels like a struggle. Loading a brush with paint and making a mark even when I have no idea at hand. Just doing things and not waiting for inspiration. You don’t wait for inspiration– you create it. So, stop thinking right now and just start doing things. I have been working on some new small pieces. When I finished this piece, which is 2″ by 6″ on paper, and was trying to read what I was seeing in it, I immediately thought of the blog entry below from several years back. 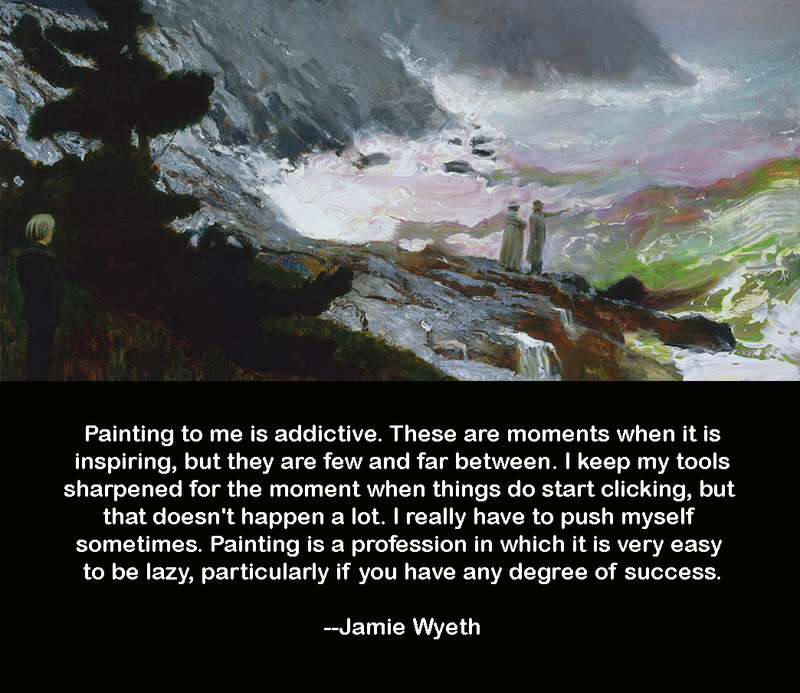 The article and the painting both deal, as I see them, with how we often look for answers from far outside ourselves and fail to see the riches and possibilities that surround us in plain sight. 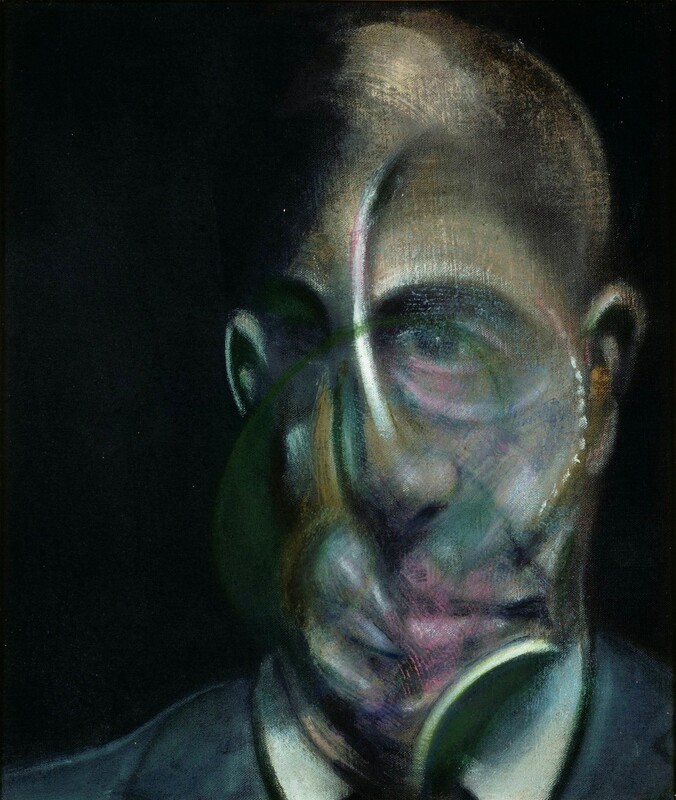 I call this painting In the Gem Fields. It’s funny sometimes what you take from an experience in your life. At one point in my life I was in the retail car business, working at a Honda dealership both as a salesman and a finance manager. In order to keep their sales staff engaged and excited about pushing their product, the management there would periodically send us to seminars with industry-specific motivational speakers and would also have sets of motivational tapes from other speakers that they would encourage us to listen to in our free time. One of the sets of tapes was from a famed motivational speaker named Earl Nightingale who had a deep and engaging voice that added a serious dimension to whatever he said. As I listened to his tapes, it was easy to feel my interest growing as he told his little tales and his lessons began registering within me. One of his stories was a short retelling of a classic lecture called Acres of Diamonds from Russell H. Conwell (1843-1925), an interesting fellow who was a baptist minister, a lawyer, a philanthropist and the founder and first president of Temple University. The lecture, one that Conwell delivered over 5000 times during his lifetime, made the point that the riches we seek are often right in our own backyards. His tale is of an African farmer who sells his farm in order to go in search of diamonds and finds nothing but failure that ends with his suicide. Meanwhile, the man who took over the farm found an abundance of diamonds and ended up with one of the largest diamond mines in Africa. There were a lot of lessons to be learned from this tale but primarily what I took away was that I must leave the car business–it was not my backyard. It was the place to which I had come in search of my own diamonds. I had not even, at that point, began to search my own backyard. I am not sure if that was the message that management had been hoping would sink in. Or maybe it was. The other part of Nightingale’s message was that you had to set a course, aim for a destination. Everything was possible if you knew where you wanted to go and truly set your mind to it. He gave a laundry list of great human accomplishments that were achieved once we put our minds and wills in motion towards their fulfillment. That resonated strongly with me. I had seen many people over the years who seemed deeply unhappy in their lives and most had no direction going forward, no destination for which they were working. Aimless, they drifted like a rudderless boat on the sea, going wherever the strongest current took them without having any influence over this motion. If you can name it, you can do it in some form. As I said, it’s funny how things influence you. It’s been about twenty five years since I heard those words but they still resonate strongly with me, even now. I try to be always conscious of the goals I set, knowing that the mind and the universe will always try to make a way for the possibility of achievement.